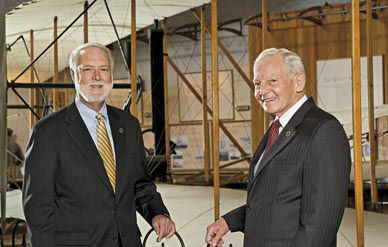 On a recent visit to the National Air and Space Museum, new Smithsonian Secretary G. Wayne Clough called his first few months at the institution a “whirlwind.” Clough, a civil engineer, came to Washington, D.C., last July to begin his tenure as the Smithsonian Institution’s 12th Secretary. For the past 14 years, he had been president of the Georgia Institute of Technology in Atlanta. “The Smithsonian has so many moving parts,” said Clough. “I’ve made 25 visits to different parts of the Smithsonian and had a chance to see the people who make it work. And everywhere you go there’s always some surprise.” One of those surprises, Clough said, was learning of the impact the Museum’s Center for Earth and Planetary Studies (CEPS) is having on the travels of the NASA rovers Spirit and Opportunity, now in their fifth year of rolling around Mars. Accompanied by NASM director Jack Dailey, Clough observed images from both rovers that had just come in from NASA’s Jet Propulsion Laboratory in California. As one of the leaders of the group directing the rovers’ mission, CEPS chairman John Grant has participated in selecting many of the sites the rovers have investigated, and receives data from JPL daily. Clough and Dailey also paid a visit to the Museum’s Paul E. Garber Preservation, Restoration and Storage Facility in Maryland. Restorers there are readying air- and spacecraft for display at the Steven F. Udvar-Hazy Center in nearby Virginia. Dailey also pointed out that it’s not just the artifacts that are being moved to the Udvar-Hazy Center; the restoration work itself will be done there. For years, seeing the restorers at work had been a favorite reason for aviation fans to visit the Garber facility, but that space couldn’t accommodate as many people as walk through the museums. When a new restoration hangar is constructed at the Udvar-Hazy Center, all visitors will have the opportunity to watch craftspeople and restorers take apart the Museum’s famous machines and put them back together again. Like the construction of the first phase of the Udvar-Hazy Center, the new $74 million hangar, which will also include space for Museum archives and a conservation laboratory, is to be privately funded. Work began in October. The $311 million Steven F. Udvar-Hazy Center, which opened in December 2003, was the largest construction project the Smithsonian had ever undertaken, and the first one funded entirely by private contributions. Those two construction projects and others at the Smithsonian depend on philanthropy, Clough noted, but there is also a critical role for the government to play. “Jack has been a wonderful fundraiser for new construction,” Clough said. “It’s tougher to support basic maintenance. That’s the job of the federal government.